*Street-beat I repeat resonating words concrete pounding out pavement statement in flub-dub of heartbeat radiating temperature of body heat. 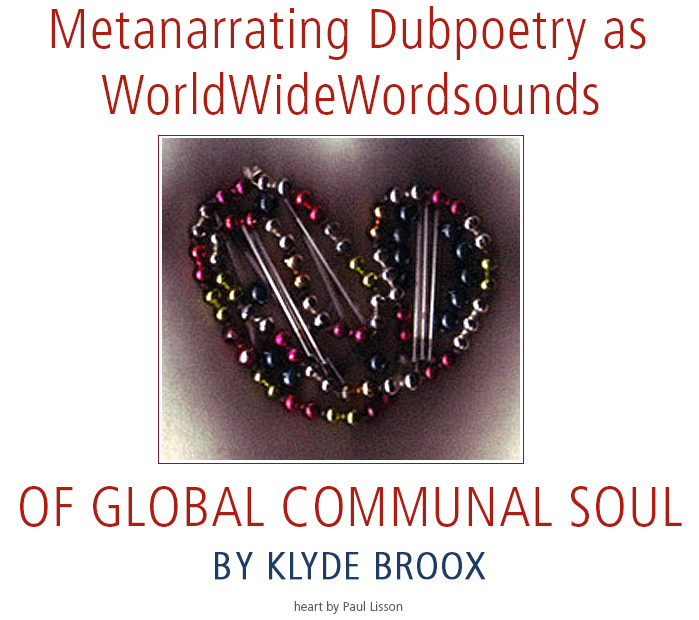 Positing ‘wordsound’ as the rhizome of multilingual common ground; dubpoetry highlights the globality of vocality under the canopy of our single sky. I and I are we, the dubbing poets of our world, whose village is this entire planet which is now being driven by enigmatic engines of technology and has whirled full circle forward to virtual campfires of computerscreened social interfaces via keyboards, microphones, and digital cameras.